The Casio Pro Trek WSD F30 has a much better design than its predecessor, but the combination of hiking and Wear OS is still an awkward one. The Casio Pro Trek WSD F30 is one of just a few truly interesting Wear OS watches. Sure, it still suffers from the usual pitfalls of the platform. Battery life is dismal if you actually use it freely, and its fitness functions fit into the software rather awkwardly. However, it has meaningful software additions for hikers. Casio has also added modes for those who like to fish, and kayakers. But the Casio Pro Trek WSD F30 makes most sense for hikers, ramblers, walkers, fell runners and other on-foot adventure activities. As with the previous generations of Casio WSD watches, you’re left wondering why you shouldn’t just go and buy something like a Garmin Fenix 5 Plus, though. To make the Casio Pro Trek WSD F30 last long enough for a weekend of trekking you have to limit its features, and only use navigation sparingly. And just like the Casio Pro Trek Smart WSD-F20, the charger is infuriating enough to get a mention right at the beginning of this review. In terms of fit and look, at least, the Casio Pro Trek WSD F30 is a major improvement over the WSD F20. Casio has slimmed down the casing to make wearing one a far less embarrassing spectacle. The watch costs $550 (£449, around AU$900). That makes it one of the most expensive Wear OS watches, but a chunk cheaper than the Garmin Fenix 5 Plus at the time of review. Casio’s main design goal for the Casio Pro Trek WSD F30 appears to be “make it smaller”. We were not fans of the WSD F20’s oversized look. And while this follow-up is still large and bulky, it seems more a chunky watch, less a plastinated funeral pyre for some middle-aged man’s dwindling testosterone and hairline. There’s still plenty of macho bravado to the Casio Pro Trek WSD F30, though. Great big shiny bolts on its sides appear to be part of the strap hinge, but are not. The buttons on the side are aggressively embossed, and the strap has a carbon fiber-like effect that’s just a pattern inlaid in silicone. Yes, Casio is out to put on a show here, and it makes a Garmin Fenix 5 seem tastefully subdued in comparison. However, let’s not forget Casio is a bit of an underdog in this space. If an ultra-rugged look helps it sell the WSD F30 as a tough watch, fair enough. We feel much less self-conscious wearing this than its predecessor, and it’s marginally more comfortable too. If you’re into the bold look, you can go further too. Casio makes versions of the WSD F30 with blue and orange highlights. The watch has great rugged cred to pair with the appearance. It offers 5ATM water resistance, making it suitable for swimming and some water sports, but not diving. It is certified to some of the US military’s MIL-STD-810G rugged standards too. This consists of 28 tests for different conditions, and Casio says the watch has been checked to meet nine of them. These are the standards for shock, vibration, humidity, low pressure, high temp, low temp, temperature shock and ice. This line likely protects Casio from any warranty claims based on ‘failed’ ruggedization. However, the spec does cover the most important real-world bases, those of low temperature and temperature changes. One other factor is worth noting, though. A couple of years ago 5ATM water resistance and MIL spec adherence were extremely expensive features. Nowadays cheap trackers like the Honor Band 4 have 5ATM, and the TicWatch S2 has both 5ATM and some of the MIL spec ticked off. Of course, the tougher the casing is, the less likely the ruggedization is to fail after, say, a year of being bashed around. The Casio Pro Trek WSD F30's shell is tough-feeling plastic aside from a plate of stainless steel on the back. And all the buttons and bolts on its sides are metal, not silver-painted plastic. The display surround is, sensibly, raised too. This should help avoid scratches on the display glass. Wear OS is not a natural fit for a hiking watch. The poor battery life of this platform means you could quite easily kill most Wear OS smartwatches within a good day’s hiking. This is why the Casio Pro Trek WSD F30’s additional screen tech is essential. It has a dual-layer display. There’s a 1.2-inch OLED of 390 x 390 pixels for Wear OS use, and a transflective display on top. It’s closer to the kind of LCD used in a traditional digital watch. It looks clearer on bright days, where the OLED layer competes with ambient light. Efficiency, not clarity, is the aim, though. It uses far less power than the OLED layer. 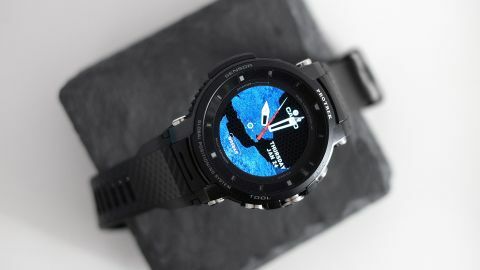 The best way to use the Casio Pro Trek WSD F30 day-to-day is to make it show the low-power display until you either tilt the watch to your face or interact with the touchscreen. However, this also limits the watch faces that look ‘right’. Casio has packed in a few of its own. There are imitations of big, chunky analog watches, another that shows an ultra-zoomed-out map of your location in the background. However, to make a smooth visual transition between the two display layers, you have to use the ‘2 layers’ watch. This makes the OLED mimic the simple digital characters of the upper layer. This may not be the tech-soaked vision you imagined for a smartwatch, but in our opinion this is the way to use the Casio Pro Trek WSD F30. It also makes the watch seem less ‘fake’, an issue with many Wear OS watch faces. You can choose between orange, blue and white for the color of the OLED’s characters. And there are two modes. Daily shows the time and either the battery level or your steps. Outdoors displays the time, altitude and pressure. As these stats can be harvested from low-energy sensors, the barometer and accelerometer, you get to see them in the non-OLED display too. The two-layer screen style paired with the '2 layers' watch face is one of the Casio Pro Trek WSD F30’s most successful elements. This screen architecture does seem to hit the OLED’s visibility slightly in very bright sunlight. However, the max backlight level is just about strong enough to compensate and there’s an Auto Brightness setting. Outdoors visibility has been improved since the WSD-F20.